This is a Wi-Fi Alliance technology, which allows two or more Wi-Fi Direct-enabled devices to connect to each other, but directly, with no need of a router or an access to a Wi-Fi network. The simplest way to pair the gadgets is physical buttons—to press the button on gadget 1 and then the same one on gadget 2. 5) confirm the choice, and enter the PIN-code, if needed. When two or more devices connect directly, they form a Wi-Fi Direct Group, using Wi-Fi Protected Setup and the latest Wi-Fi security. If the Wi-Fi Direct connection was established successfully, the both devices would see each other, and the user can now choose the document on a mobile device and send it to the printer. This entry was posted on Friday, April 4th, 2014 at 6:49 am	and is filed under General. 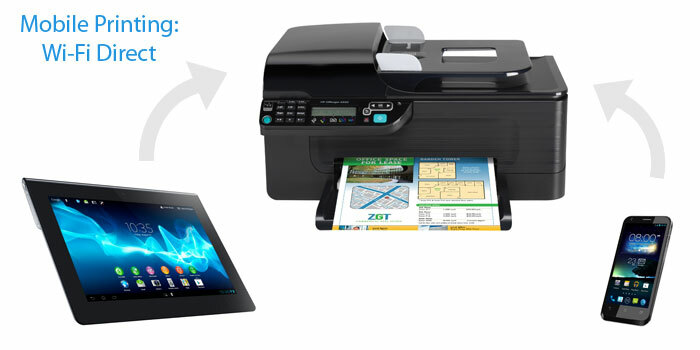 "New Epson Printers And MFPs With Huge Capacity Ink Cartridges"
"5 Ways To Print Directly From Smartphone Or Tablet: AirPrint"